This app contains the complete list of 8,500 Generic DTC definitions specified by SAE. They will be updated as soon as a new list is issued. 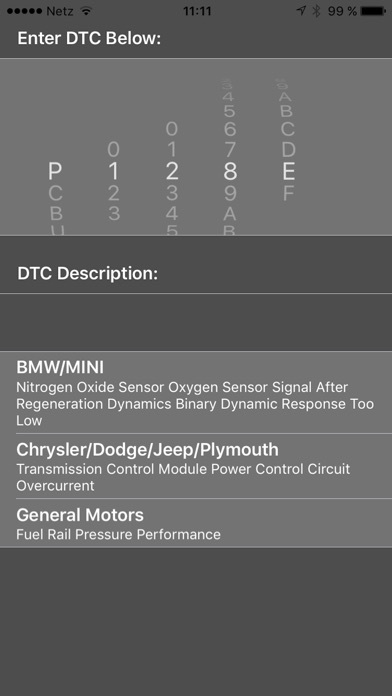 Additionally, this app currently contains more than 7,300 manufacturers' specific DTC definitions for the vehicles below, leading to more than 26,200 database entries in total. These definitions are occasionally updated. All entries are held in an offline database. So there is no internet connectivity needed in order to access them. 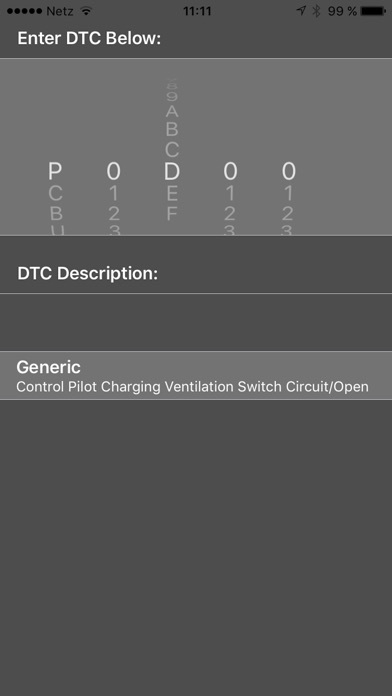 So this database helps you identify the DTC code delivered by any OBD-II scanner. Please note that this app is NOT a DTC code scanner! Currently supported makes/manufacturers are: Acura Alfa Romeo Audi/Volkswagen/SEAT/Skoda BMW/MINI Chrysler/Dodge/Jeep/Plymouth Citroen/Peugeot Daewoo Fiat Ford/Lincoln/Mercury General Motors Geo Honda Hyundai Isuzu Jaguar KIA Lamborghini Land Rover Lexus Mazda Mercedes-Benz Mitsubishi Nissan/Infiniti Opel Porsche Saab Scion Subaru Suzuki Toyota Volvo Please take into account that the list of manufacturers' entries cannot be complete because of the frequent changes taking place.